A federal appeals court has revived a challenge to a company’s right to mine uranium near the Grand Canyon. The company’s claim was grandfathered in when new regulations were put in place by the Obama administration. FLAGSTAFF, Ariz. — A federal appeals court has revived a challenge to a company’s right to mine uranium near the Grand Canyon. An Obama-era decision prohibits new mining claims on roughly 1,562 square miles outside the boundaries of the national park through 2032. But that doesn’t keep uranium companies with grandfathered claims from developing them. The U.S. Forest Service concluded in 2012 that Energy Fuels Inc. has a valid, existing right to mine near Tusayan, the gateway town to the Grand Canyon’s South Rim entrance. The company is waiting for uranium prices to rebound before reopening the Canyon Mine. Environmental groups and the Havasupai Tribe challenged the Forest Service’s determination in a lawsuit against the agency and Energy Fuels. The U.S. District Court in Arizona said the groups and tribe lacked standing, and the 9th U.S. Circuit Court of Appeals initially upheld the ruling last December. But in a revised decision Thursday, the appellate court said the claim survives under another federal law and must be decided on the merits. “As opposed to saying ‘you don’t have the right to make this argument,’ it’s affirmed that we have the right to make that argument,” said Amber Reimondo, energy program director for the Flagstaff-based Grand Canyon Trust. Curtis Moore, a spokesman for Energy Fuels, said the ruling isn’t a major setback for the company and he was confident it will prevail in the district court. “We don’t perceive this as that big of a deal,” he said. Claims were staked in the 1970s for the Canyon Mine but no mining has occurred there, and no uranium mines are active in Arizona. Energy Fuels notified the Forest Service in 2011 that it wanted to resume work to open the mine, triggering the review for valid, existing rights. The Grand Canyon Trust, the Center for Biological Diversity, the Sierra Club and the Havasupai Tribe argue the Forest Service’s review failed to consider the environmental and cultural costs of mining. “A prudent person wouldn’t mine that resource if you’re truly considering all the costs,” Reimondo said. 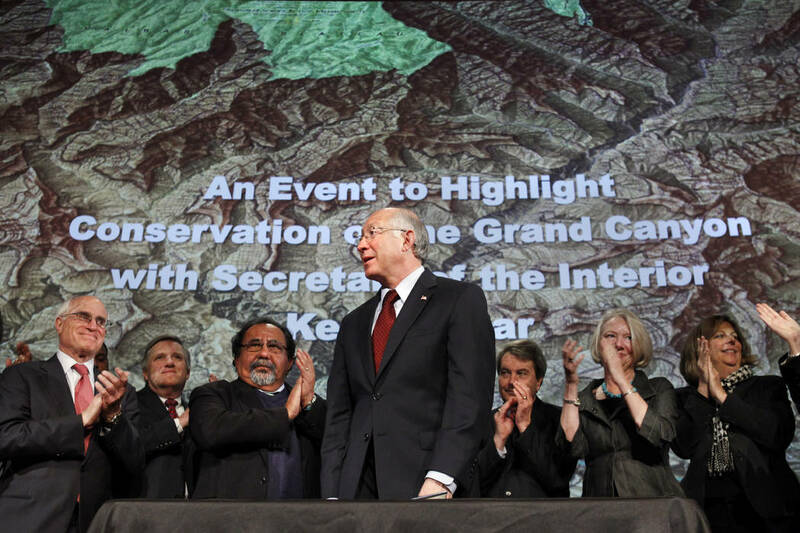 A spokeswoman for Kaibab National Forest, Liz Schuppert, said Friday the agency hasn’t reviewed the 9th Circuit decision. While the appeals court revived one of the claims, it did not agree with environmentalists that a 1988 environmental review should be updated or that the Forest Service failed to properly consult with the Havasupai Tribe about mining near Red Butte — a site the tribe considers sacred as the center of its ancestral land. The tribe has said it is concerned uranium mining could contaminate its water sources. Judge Frederic Block, who authored the opinion, said the Forest Service made a good-faith effort with the tribe to resolve possible adverse effects of mining. If the effort wasn’t successful, he said it’s because the tribe insisted on things the Forest Service is not legally required or has the authority to do.